Explanation: What's that inside the Heart Nebula? First, the large emission nebula dubbed IC 1805 looks, in whole, like a human heart. It's shape perhaps fitting of the Valentine's Day, this heart glows brightly in red light emitted by its most prominent element: hydrogen. The red glow and the larger shape are all created by a small group of stars near the nebula's center. In the heart of the Heart Nebula are young stars from the open star cluster Melotte 15 that are eroding away several picturesque dust pillars with their energetic light and winds. The open cluster of stars contains a few bright stars nearly 50 times the mass of our Sun, many dim stars only a fraction of the mass of our Sun, and an absent microquasar that was expelled millions of years ago. The Heart Nebula is located about 7,500 light years away toward the constellation of the mythological Queen of Aethiopia (Cassiopeia). Interesting picture, very suitable for Valentine's Day. I like the picture, but I would like to know more about how it was made. 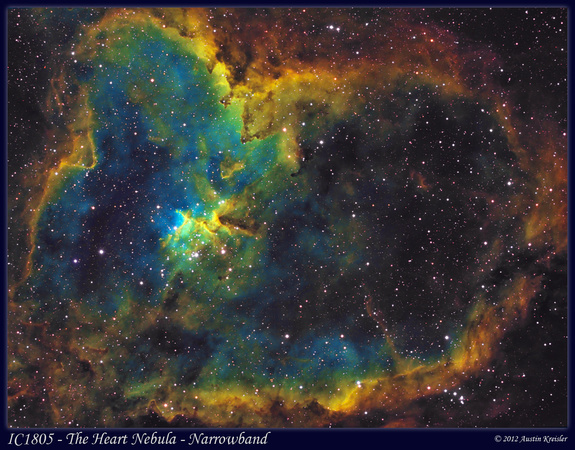 A "pure" RGB portrait of the Heart Nebula would probably make it look very red, like this picture. An HαOIIISII narrowband image would make the nebula look flamboyantly blue, green, yellow and orange-brown, like this picture. Well, perhaps today's APOD is a relatively normal RGB picture with a little extra blue for contrast. The red glow and the larger shape are all created by a small group of stars near the nebula's center. Well, yes. But the wording makes it sound as if the hot stars emit copious amounts of red light themselves. Actually, they do emit copious amounts of red light, but they emit a lot more blue light and very much more ultraviolet light. It is all the ultraviolet light that ionizes nearby hydrogen atoms, knocking their one electron into a higher orbit, which then causes the electron to emit red light as it drops back into its normal orbit again. I like the picture, but I would like to know more about how it was made. Ann, this is a bi-color image, with h-alpha and OIII data. The h-alpha is assigned to red, and OIII data assigned mainly to blue and somewhat to green. The larger stars are from RGB data; otherwise they had a cyan cast to them. The color balance was slightly dialed in to taste. What i like about Valentines Day? It's called chocolates! I got some for the whole family! !